120 pages | 5 B/W Illus. The first in the Focus Series on Global Science Education, The Whys of a Scientific Life examines why scientists do what they do. Working from a diverse background in scientific research, including academic departments of physics and chemistry, as well as the scientific civil service, the author describes the choices scientists make. Fundamentally, a scientist asks questions based on curiosity. In addition, the environment is very important. By influencing their elected governments, society itself shapes the scientific research that is undertaken by scientists. 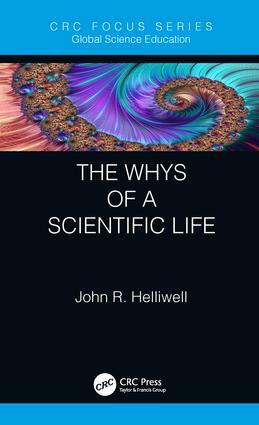 This book follows on naturally from the author’s last book, Skills for a Scientific Life, which is a how-to guide for scientists and those that aspire to engage in science as a career. Why do scientists confer so much? Why do scientists submit their research to a journal? Because of data and peer review. Why is Science a joy to do? John R. Helliwell is Emeritus Professor of Chemistry at the University of Manchester. He was awarded a DSc degree in physics from the University of York in 1996. He was Director of Synchrotron Radiation Science at the Council for the Central Laboratories of the Research Councils (CCLRC). He has served as President of the European Crystallographic Association (ECA). He is a Fellow of the Institute of Physics, the Royal Society of Chemistry, the Royal Society of Biology, and the American Crystallographic Association. In 1997, he was made an Honorary Member of the National Institute of Chemistry, Slovenia. He was elected a corresponding member of the Royal Academy of Sciences and Arts of Barcelona, Spain, in 2015. He was made an Honorary Member of the British Biophysical Society in 2017. He was the Kathleen Lonsdale Lecturer of the British Crystallographic Association in 2011, the Patterson Prize Awardee of the American Crystallographic Association in 2014, and the Max Perutz Prize Awardee of the European Crystallographic Association in 2015. He is the International Union of Crystallography Representative at the International Council for Science Committee on Data. He has published more than 200 research publications and two research monographs.